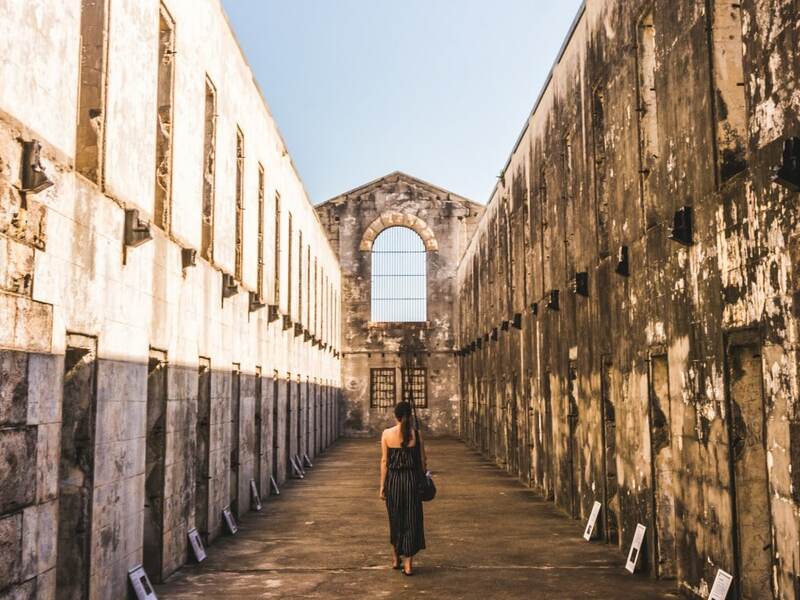 10 unique places to see between Sydney and Brisbane - road trip ideas! Sydney is a popular starting point for the famous East Coast Australia Road trip. After being in Australia for over a year it’s safe to say we racked up quite a ‘to-do list’ before we started ours, so we decided to split our trip into sections and do a slow road trip from Sydney to Brisbane first. This meant we got to explore a lot of little places on the way to Brisbane that backpackers perhaps wouldn’t usually stop at. 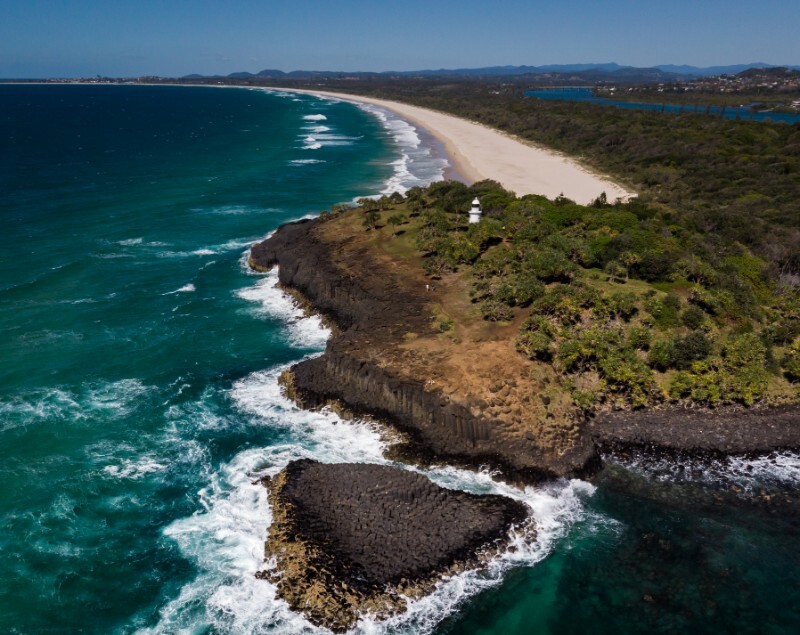 This week we want to share those places with you so when you come to do your trip, you can see more of the East Coast than Byron Bay and Coffs Harbour. 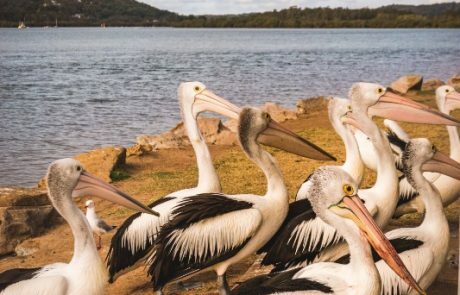 This list of unique places to see between Sydney and Brisbane contains what we think were the least touristy spots along the way! Time from Sydney – 1 hour 10 minutes. Time from Brisbane – 9 hours 10 minutes. Just an hour from Sydney is Woy Woy. This little town sits on the edge of a river and is a great little break on the road trip from Sydney to Brisbane. There are no high-rises here or big shopping centres, to many they just drive straight through. To us though, it’s a highlight of our trip. 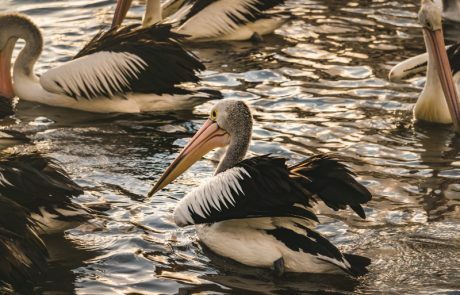 The river that runs through it provides a home to hundreds of pelicans who call the nearby island – Pelican Island – home. If you’re there around 3 pm, you’ll get to see the daily feed; the local rescue team come to feed them scraps of fish and check their health. They’re really helpful and happy to answer any of your questions. 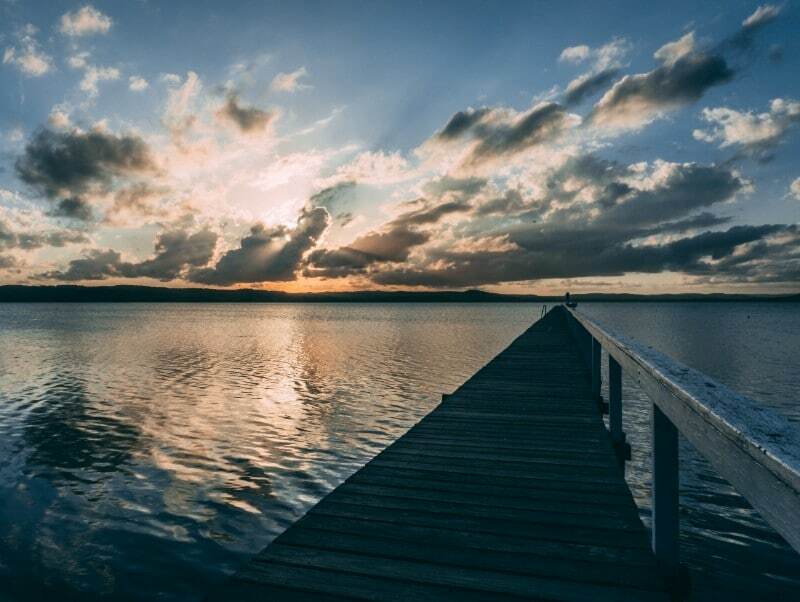 Take a stroll down Fishermans wharf, grab a bite to eat at the waterfront cafe or indulge in a bit of history at the Aboriginal carving site just south of Woy Woy. Time from Sydney – 1 hour 20 minutes. Time from Brisbane – 9 hours. Long Jetty is yet another unique little town on the Central Coast. Its streets are lined with vintage stores and trendy cafes but this wasn’t what we loved most about Long Jetty. Long Jetty is a photographers dream as it’s lake consists of, you guessed it, Long Jetties. 3 historical long jetties jut out from the beach, Parry’s, Watkins and the original ‘long jetty’ from which the town gets its name. Each with its own history but ‘long jetty’ is the main attraction. 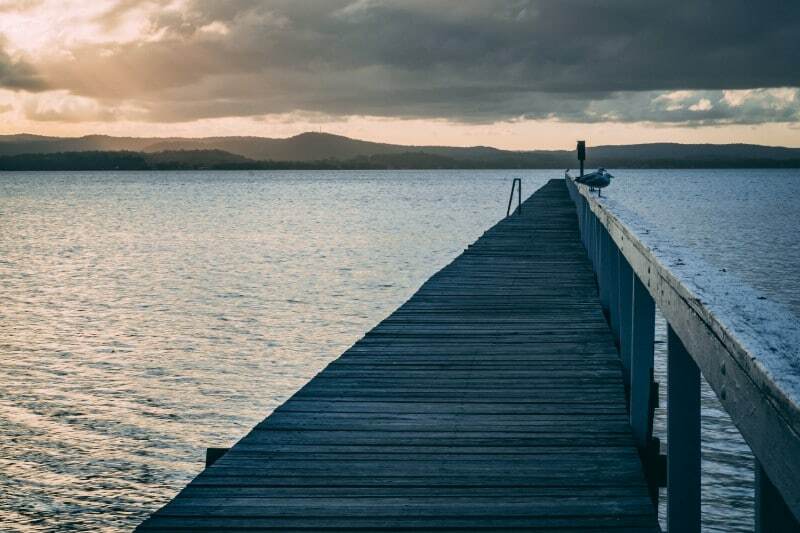 At 351m long, it’s the longest jetty in New South Wales and was built in 1915. Around Lake, Tuggerah is a 12km return cycle track to Chittaway Bay and back, or you can head in the other direction to a small town called The Entrance (more on that next). Bike hire is available at the innovation centre, or you could hire paddle boards and head out on to the water! There’s Pelican feeding along here too by the rescue team, but it’s a lot busier than at Woy Woy. The Entrance to what, I hear you ask? Well, this is where the ocean runs inland to make Tuggerah Lake. At The Entrance Beach, you’ll find a stunning ocean swimming pool, similar to the one at Bondi Beach in Sydney. So if you fancy a swim to break up your East Coast Australia road trip, just an hour and a half from Sydney, this is the place to come. If you fancy a stroll, starting at the beach you can take the Coast to Lake walk. This will take you along the beach to Tuggerah Lake and back to The Entrance, it’s about an hour and a half walk but the views are worth it. This is also where the cycle path through Long Jetty starts if you want a bit of a longer ride. Heading to Sydney from Melbourne? 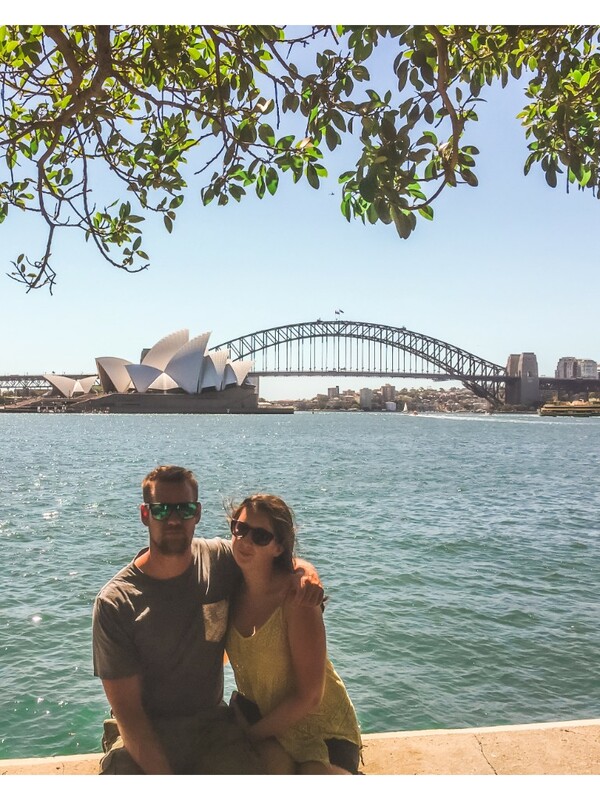 Check out our Melbourne to Sydney road trip itinerary! Explore all the places to see between Sydney and Brisbane with us in part one of our East Coast Australia road trip video series. Watagans State Forest abandoned plane. Time from Sydney – 1 hour 40 minutes. Time from Brisbane – 8.5 hours. This state forest is just one hour inland from Newcastle and it’s one of the places to visit between Sydney and Brisbane that we’d recommend in a heartbeat. 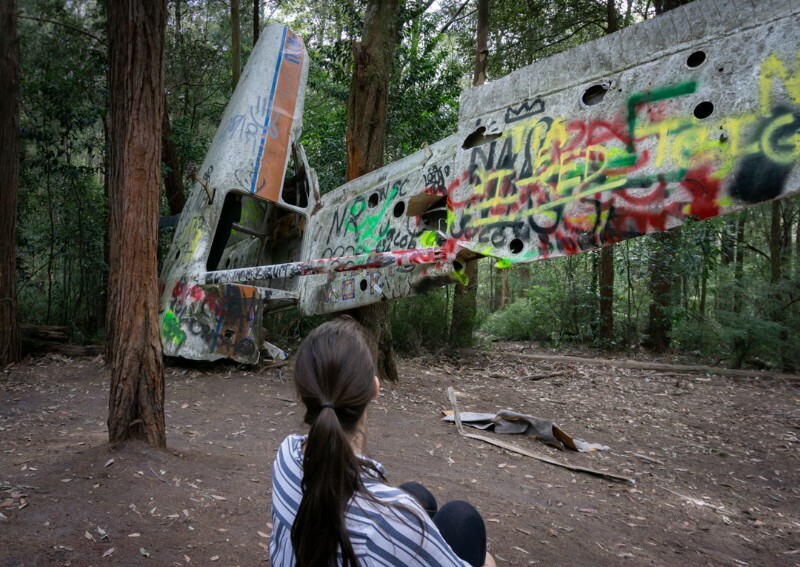 The abandoned plane at Watagans state forest isn’t well known about, it isn’t sign posted at the park and there are no official tracks to it. We stumbled across it thanks to the Wiki Camps app (I’ll link to its pin here to help you find it). The track up to the nearby car park is so steep we actually ended up parking in a pullover and walking for 20 minutes to reach it, but it was worth it. With over 40 aboriginal sites that have historical engravings and stories attached to them, there’s plenty to do at this stop on your road trip from Sydney to Brisbane. There are also plenty of walking tracks and lookouts, including one track that goes to creek falls which looks beautiful after a heavy rain. Time from Sydney – 4 hours. Time from Brisbane – 6 hours. While you’re travelling along the East Coast, it’s safe to say you’re going to see your fair amount of beautiful beaches. Camden Head is a beach with a difference. Camden Head is home to a huge rock platform that sticks out from the beach, creating some epic rock pools and fishing platforms. At low tide, you’ll be able to explore the pools and try your luck at finding a blue-ringed octopus… just be careful where you’re sticking your hands. Camden Head is actually within Kattang Nature Reserve so there’s a lot of wildlife spotting to be done here. Or if you fancy a walk, Perpendicular Point walking track is a 3.7k return walking track that offers some fantastic views from the cliffs edges as well as a good vantage point for whale spotting. 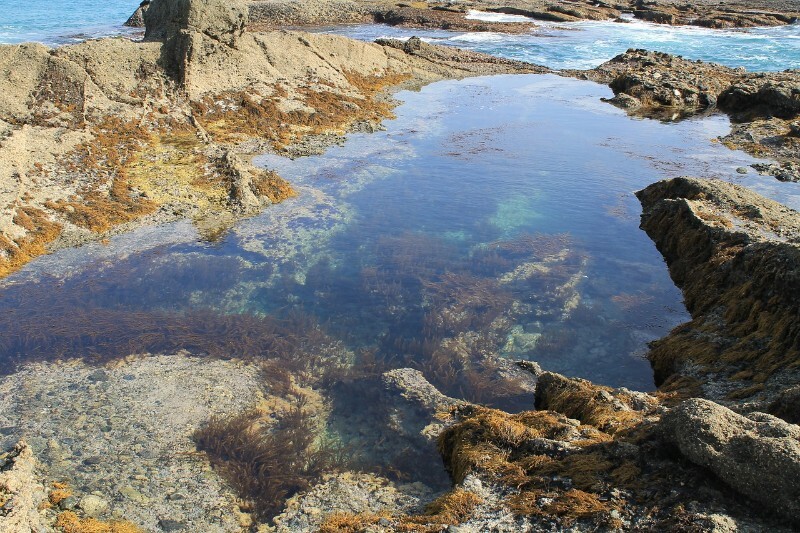 Rock Pools. Photo from Pixaby. Time from Sydney – 4 hours 10 minutes. Time from Brisbane – 5 hours 50 minutes. We absolutely loved this coastal town and was easily one of our favourite places to see on the way to Brisbane. 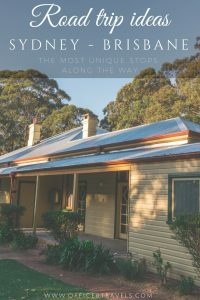 There is so much to do here, we’d recommend coming for a few days as a good halfway point on your road trip from Sydney to Brisbane. 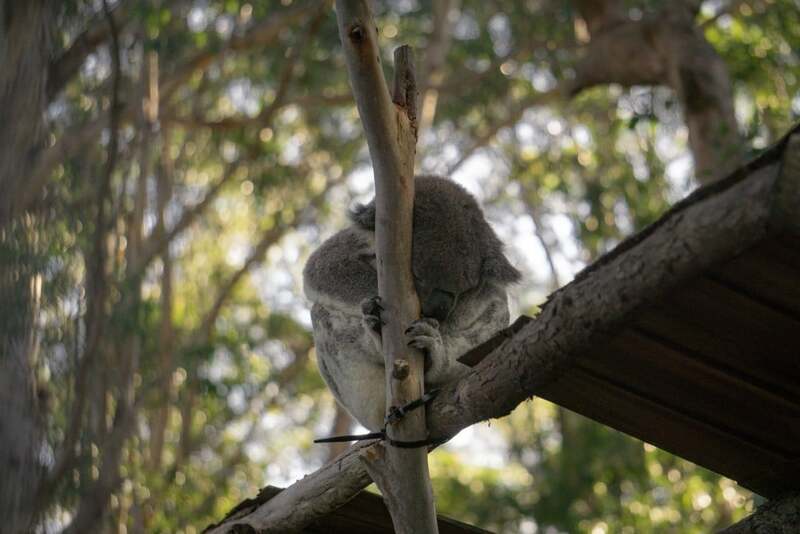 Our favourite thing in Port Macquarie was its free Koala sanctuary. They do guided tours every day at 3 pm where you get to learn a lot more about their patients and resident koala as well as see them getting their daily treat; so you’re almost guaranteed to see them awake. Visit the lighthouse or take a walk around the historical Rotto House, located next to the Koala sanctuary. We have heaps more suggestions in our post all about our visit to Port Macquarie. Time from Sydney – 4 hours 56 minutes. Time from Brisbane – 5.5 hours. If you like history and old buildings, this is one of the most interesting places to see on the way to Brisbane. It’s an old abandoned prison that’s seen it’s fair share of inmates but it isn’t like other prisons, you can find out more about it in our dedicated South West Rocks post. There are some really nice walks around the South West Rocks area, as well as a clean camping site if you want to splash out and pay for a site. They get kangaroo visitors around here so don’t be surprised if you get one pop by to try and steal a biscuit or two. Time from Sydney – 6 hours 15 minutes. Time from Brisbane – 5.5 hours. This is a great spot to spend a few days, especially if you’re a fan of hikes and amazing views. The first place you need to go is Point Lookout, it’s 1500m above sea level so on a clear day you can see everything from the rainforest canopy below right out to the Pacific ocean in front. It’s only a 200m walk from the car park so it’s suitable for everyone. Cascades walking track takes you passed some of the waterfalls in the area while the Lyre Bird track takes you through the valley. 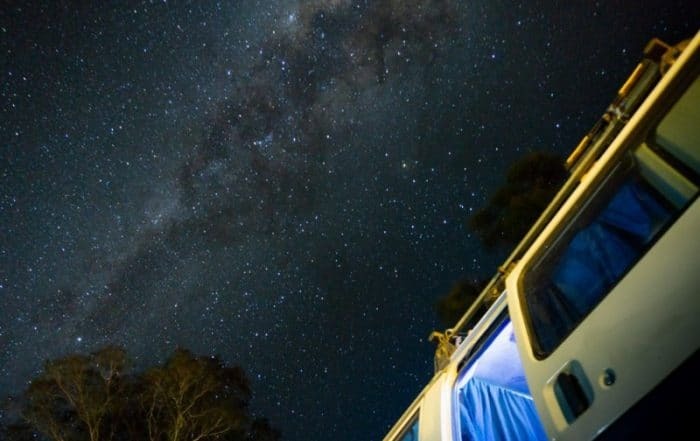 There are a few camping grounds available with an NSW parks pass or there are some beautiful Air B+B’s available! Time from Sydney – 8 hours 50 minutes. Time from Brisbane – 1 hour 15 minutes. This is the last New South Wales town you’ll visit on your East Coast Australian road trip, and the first town of Queensland. But how can it be both? Tweed is a border town that is split almost completely in half by the NSW/QLD border and it’s such a cute little town you have to stop and see it. In the centre, right on the border, you’ll find the boarder statue in the middle of the round-a-bout. It makes for a great photo opportunity and inside there’s a little bit of history on how the border was decided. Besides all the shopping and little cafes available at tweed, it also has possibly the most unique coastal landscape that you’ll see on your road trip from Sydney to Brisbane. At Tweed, you’ll find Australia’s very own Giant’s Causeway and you can read all about it in our dedicated post about Tweed! Time from Sydney – 9.5 hours. Time from Brisbane – 1 hour. 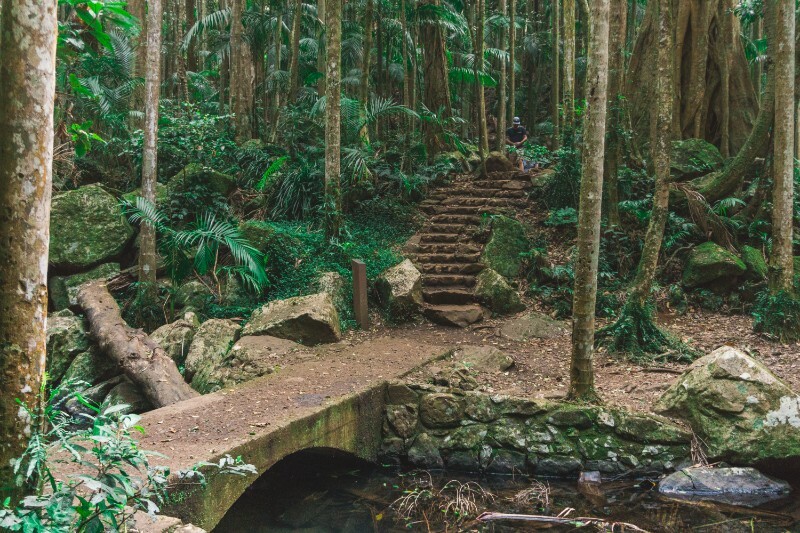 If you’re looking for magical places to see on a road trip from Sydney to Brisbane, then look no further than Mount Tamborine National Park. Not only is it a web of walking tracks through a beautiful rainforest, but it’s also home to Glow Worms and a collection of beautiful wine tours! What more could you want? The Glow Worm cave tour was the highlight of our trip to the mountains and we’d highly recommend it. Of all the places to visit between Sydney and Brisbane, this one marks the final stop! 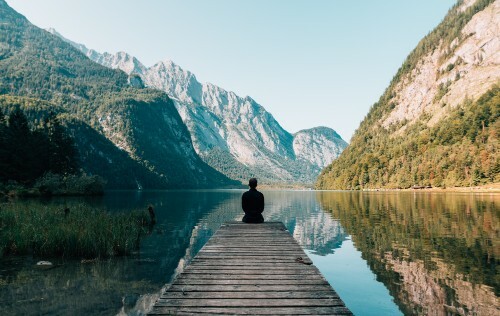 You’re just one hour from Brisbane now so take the time to fully immerse yourself in nature here. As I mentioned briefly there are heaps of walking tracks to do here, all with varying difficulty and scenery. We did a more in-depth post about the walking tracks in Mount Tamborine if you want to know the full details. Our favourite was Curtis Falls as is offer great views of waterfalls as well as an interesting winding track through the valley jungles. So those are our 10 favourite places to see between Sydney and Brisbane. There were so many other that we could have added to the list but these stuck out the most for obvious reasons. If there’s anything we took away from part one of our East Coast Australian Road trip, it was that every single part of Australia is so different. 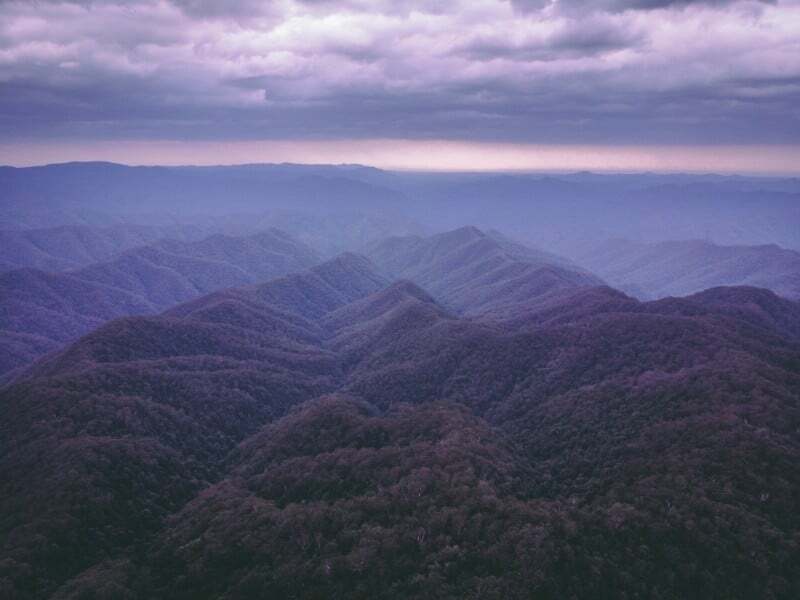 As soon as you cross the border from New South Wales into Queensland, it just all changes and I can assure you, the same will happen again in Part 2 – Brisbane to Cairns!! What were your favourite places to visit between Sydney and Brisbane? We’d love to hear about the ones we missed off our list!! Drop us a comment or catch us on our Facebook page! Other posts we think you’ll love! Wow, I had no idea there were so many great visit between Sydney and Brisbane. I have been to both places but we drove straight from Sydney to Brisbane and didn’t stop much. Now I wish that we had. Thanks for this great share! I love how every place you highlighted had its own unique features! I would love to see the Koalas in Port Macquarie and take some of the hikes you mentioned next time I am in Australia. The full 10+ hour road trip sounds fun, but I could even see myself doing day trips to the locations you mention that are 1-2 hours from each city. Thank you for the recommendations! 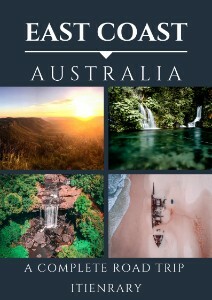 I’m bookmarking this as I’ve been wanting to do an Australian road trip. I would really love to visit the Koala sanctuary 🙂 Also, great footage! The aerial shots were gorgeous! What a great adventure this is … we have been to Sydney, and from there flew to New Caledonia for a sailing adventure, arriving two weeks later back in Brisbane. So we have been on either end of the trip, but missed every bit in between. 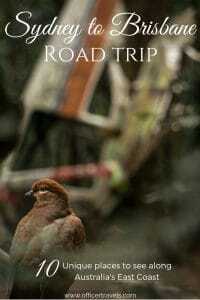 This sounds like a must-do road trip … animals, history (love the abandoned prison and plane wreckage) and scenary. Bookmarked this post for future reference!!! We would never get to our destination due to all of the amazing stops along the way. 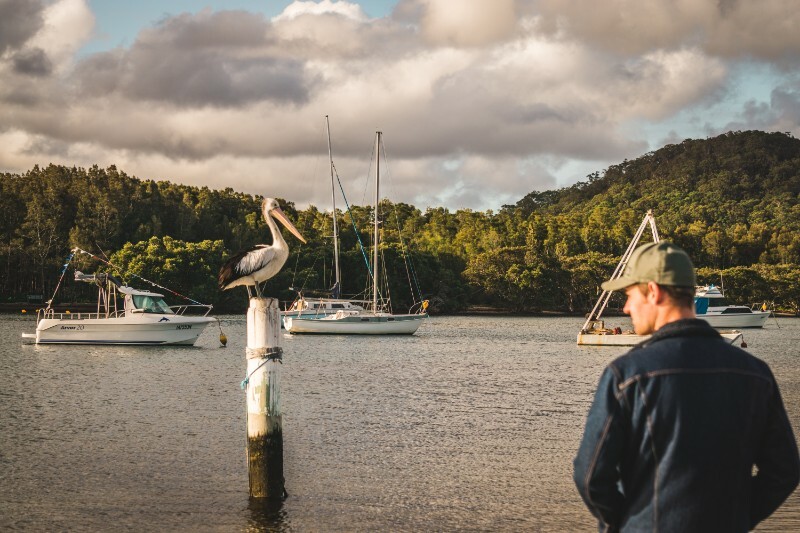 Since our family is an animal-loving, nature-admiring one, we would definitely need to stop in Woy Woy to see the pelicans and Port Macquarie to see the koalas. 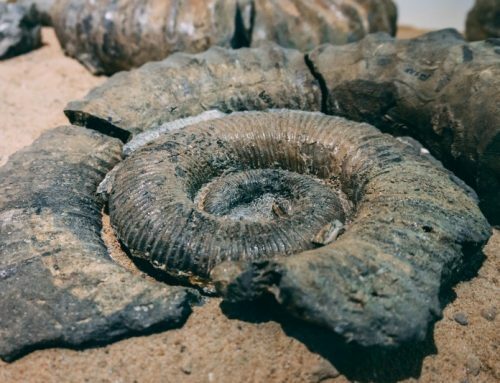 And we definitely would want to spend time in Mount Tamborine National Park to see the glow worms, take a cave tour and enjoy the national park. It sounds like you cannot go wrong at any stop along the way from Sydney to Brisbane. Oh Pelican Island is definitely cool, I would have to see that! Also that abandoned plane wreckage is quite fascinating, I want to see that too. I really want to do the whole drive and explore as much of Australia as I can since I’ve never been! Oh, oh, oh…Port Macquarie for those koalas and kangaroos at the South West Rocks!!! LOVE! Is the prison known for being haunted out of curiosity? It looks like it might be! You have a lot of fun things on this itinerary! Wow, so many amazing looking places!! It would be hard to pick just a few! 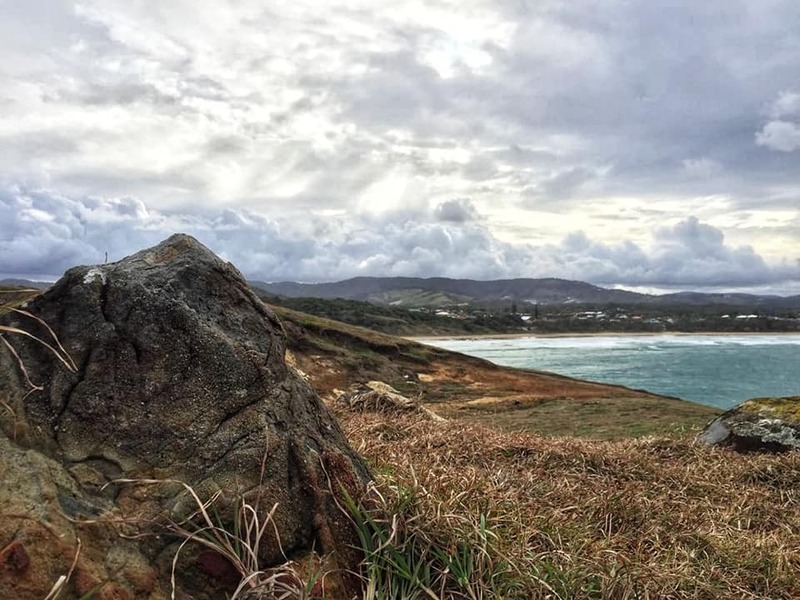 Both of the national parks look beautiful, and so does Port Macquarie form all of your Instagram photos! I’d also like to know the story behind the abandoned plane and how it go there! You’ll be pleased to know the plane wreck does have a happy ending! I wrote about it more on my Instagram post. Glad you enjoyed it Maggie! This road trip looks wonderful! We are hoping to take a road trip in a camper van in Australia in the next couple of years and this looks like an amazing route to follow. I love coastal routes and all these National Parks seem to have so much to offer. I really want to see the glow worms! This is not an area of Australia with which I am familiar (only been to Adelaide area, Cairns and Whitsundays) so lots to explore. Thank you. 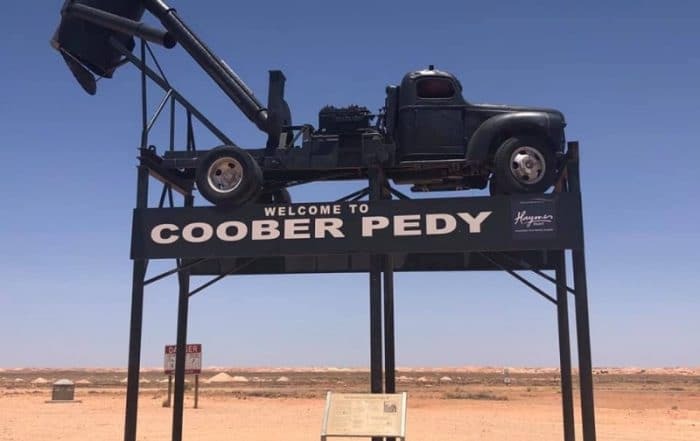 Australia is the best place for road trips it really is, each state is completely different! I hope you have a great time!! Oh, this completes one of the segments of the road trip we are contemplating from Melbourne to the Great Barrier Reef. Thanks for putting together what national parks, what wildlife, and other quaint towns we can visit from Sydney to Brisbane! Aww I hope you enjoy your trip!! We’ve done a similar post for Melbourne to Sydney that might help too! Pelican feeds, koalas in trees and kangaroos sound beautiful, but I am also just a sucker for coastal drives. This seems like one of the most beautiful roads out there. It definitely rivals the Great Ocean Road that’s for sure Jenn! 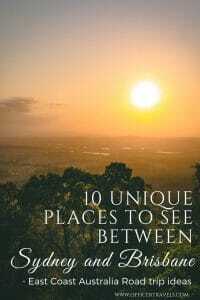 I have alway wanted to go to Australia, Thatk you for this list of places to go. Your pictures are beautiful and I espically love how you put the hours from place to place. That is very helpful.